Why aren't the titles parsed when suggesting questions? I think it would be very useful to have them parsed by default. where hookAjax() is a wrapper around $.ajaxSuccess() that I use to inject code into the SE framework's AJAX handling. ps. The next version will also include a fix for the related issue on the user profile page pointed out by Karl Kronenfeld in the comments. I missed that comment originally, which is why it's not in v.1.2.0 yet. Not the answer you're looking for? 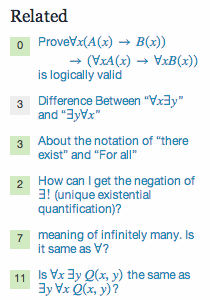 Browse other questions tagged bug mathjax asking-questions titles editor .